This is the second try. The first one had a couple of cables crossed the wrong way and I didn’t like how I spaced the increases. One thing to note about this sleeve is that the saxon braid is not centered on the piece. There’s about 1cm more on the right side than the left. According to Jean the front part of the shoulder panel should sit about 1cm more towards the front. So with my Aran sleeve which has a 7cm panel, 4cm of it will be on the front and 3cm will be the back. Unfortunately my notes don’t say why we need to do this. I’ll ask when we have our next class. Sophie couldn’t help herself … just had to be in the picture and attack my sweater. I had to pry it out of her paws after this photo. This is the front. The back is about half done (and looks the same). It’s coming along ok. When I hold it against my body it almost looks like a corset … very stiff. The yarn should soften when washed, at least that’s what happened with the swatch. After the sleeves are finished I’ll start the gansey swatch. Last weekend I had fun playing paper dolls in Sally Melville’s Knitting to Flatter and Fit class at Madrona Fiber Arts Winter Retreat. The half day class was packed with lots of information but what stuck with me the most was her emphasis on maintaining or tricking the eye into see a hour glass shape. 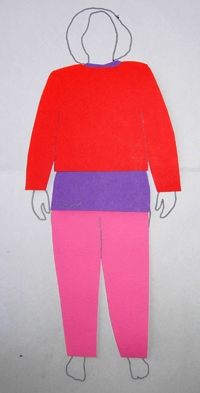 Sally illustrated her points by having us dress our 1/8 scale silhouette with various garments. Here are some of my “paper dolls”. Unshaped short sweater: This is the length I normally make. But according to Sally a short unshaped sweater is not flattering with these type of pants. The hour glass shape is lost and the eye is drawn to the hips. Unshaped short sweater with Palazzo pants: I’ve never worn these type of pants. Not sure if I’d look good in them. Sally says unshaped short sweaters look much better with these pants because the fullness of the pants helps the eye see an hour glass shape. Unshaped short sweater over a long shaped shirt: Sally mentioned that a short top can be worn over a longer one to help maintain an hour glass shape. So many interesting concepts. Sometimes I think this type of thing is more of an art than a science. Not all of us could see what she was seeing. One thing I did see was that I really should make my shaped sweaters longer and cut my hips in half. I look forward to seeing her new book that’s coming out next March. And here’s what I have on the needles … a boxy Aran sweater. The last few weeks have been challenging. I’m trying to keep up with my knitting projects/homework but other issues keep popping up. Finally, I have a few moments to post a picture of my Aran swatch. The full saxon braid on the left will be the center of the sweater. The smaller one on the far right will be on the center of the sleeve. The XO patterns between the saxon braids on the swatch will be on either side of the full saxon braid. The sides will be filled in with double moss stitch. I was going to make set-in sleeves but changed my mind after realizing that doing so would probably mean that the last one of the OX columns would get cut off if I didn’t make some adjustments. Instead of changing the stitch pattern configuration, I’ll go ahead and redraft the pattern to include 2cm to the upper body and modifying the sleeve to be a modified drop-shoulder. And here’s my other homework. Six swatches neatly blocked with various notes about the blocking process. Also, for the other class, I have the outline of my body ready to go. These two classes should be very interesting.